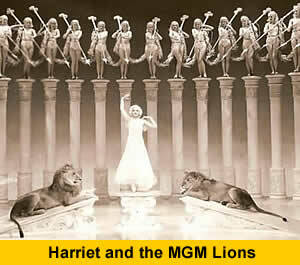 My memories of Harriet Hoctor go back as far as my memories go, for to me she was always Aunt Harriet. She was my mother's sister, and because she never married, her closest family remained the family in which she grew up. When her brother and sister had families of their own, Harriet came to adore all of them, treating all six of her nieces and nephews much as an indulgent grandmother would. She was our favorite relative, and we loved her dearly. Her teaching partner, Gerry Cragin, was always part of the family as well, and their visits to our homes were always exciting. In that our extended family was a big, raucous Irish family, holidays were always boisterous and generally happy occasions, and Harriet was always in the middle of it. Harriet loved Christmas and Thanksgiving and birthdays, and her visits made many of those occasions memorable. My cousin Harriet Hoctor Groeschel and I have spent many hours reflecting on what we knew of Harriet, her career and her life within the family, and we have become convinced that what the public knew of Harriet Hoctor was far from the whole story. Although we were always conscious of the glamour that was part of the picture of Harriet, we also saw a very different side of her, one that was not always so glamorous. Especially in the last few years of her life, when she lived with me and my family, she began to reflect on things in her life that, wonderful as they were, might have been different. In these pages we who knew Harriet intimately will try to create a fuller picture of her. We have no secrets to expose, for during all her life Harriet was the charming, happy, delightful, loving person that she appeared to be to many of those who knew her only from her stage presence. There is no dark side, but it was not all happy, and in many ways she deserved better than what she got. The parts of her life that did not work out—mostly in the later years—were not her fault, for, as will be apparent from the trace of her life, she was not prepared to deal with the real world. Fascinated as we were by Harriet's fame, we also find some truth in the song from Kern and Hammerstein's Showboat, “Life upon the wicked stage/Ain't ever what a girl supposes.” Although Harriet had a wonderful career, her life as a dancer was not all it might have been. Nevertheless, she passed away in peace, and we who knew her best at the time of her passing will always miss her. As we develop these pages about Harriet, we hope to hear from others who knew her—her students, those who went on with their own dancing careers and those who followed her path as a dance teacher.